China's brand new islands Jump to media player China has been building new islands in the South China Sea to the alarm of its neighbours. US calls halt to land reclamation Jump to media player The United States has called for an immediate and lasting halt to reclamation works by all claimants in disputed waters in the South China Sea. Tensions rise in South China Sea dispute Jump to media player Tensions between China and the Philippines have increased in recent weeks over who controls a group of small uninhabited islands in the South China Sea. How can the dispute be resolved? 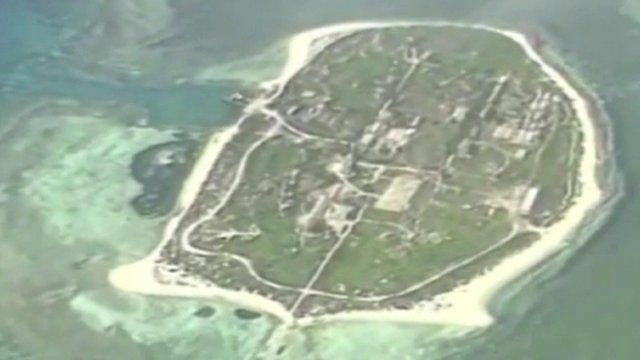 The news came faster than many expected - China says it will finish building some new islands in the South China Sea "within days". The construction work has been carried out at a breakneck pace, to the alarm of the United States and many of China's neighbours, who have overlapping claims to the same waters. From Beijing, Celia Hatton explains.